TOKYO, Japan (CNN) -- An American father jailed in Tokyo has been harshly treated, his attorney said Monday, while Japanese authorities said he is getting "special" treatment. 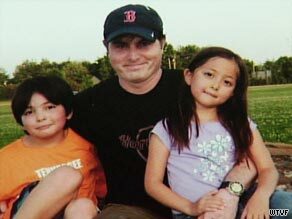 Christopher Savoie is in jail in Japan after trying to get back his son, Isaac, and daughter, Rebecca. Attorney Jeremy Morley, in a statement released Monday, said Christopher Savoie -- accused of trying to kidnap his children after his ex-wife took them to Japan -- is being held without trial, interrogated without an attorney present and denied needed medical treatment for high blood pressure. Savoie has also been exposed to sleep deprivation, and denied private meetings with attorneys and phone calls to his wife, according to Morley, who said the way his client has been treated amounts to "torture." He acknowledged that some of the claims are based on second-hand information from Savoie's wife, Amy, saying she has communicated with people familiar with her husband's case. Police in Yanagawa, a rural town in southern Japan where Savoie is being held, denied the allegations in Morley's statement, saying Savoie gets regular visits by a physician and medicine as prescribed. A Yanagawa police officer, who declined to give his name citing departmental policy, told CNN that Savoie, like any other detainee, has a "dim" light in his cell for safety, and is assured to get 8 hours of sleep a day. Savoie is being questioned -- with an interpreter -- within the boundaries of Japanese law, which allows for suspects to be interviewed without the presence of an attorney, the officer said. The law also permits several rounds of questioning for hours on end, the officer said. The officer said Savoie is allowed "frequent" visits with his defense attorney in Japan and is generally given "special" treatment due to the nature of his case, the officer said. "If you call this 'torture,' what can we say?" the officer said. Savoie, 38, a Tennessee native and naturalized Japanese citizen, allegedly abducted his two children -- 8-year-old Isaac and 6-year-old Rebecca -- as his ex-wife walked them to school on September 28 in Yanagawa. With the children, Savoie headed for the nearest U.S. consulate, in the city of Fukuoka, to try to obtain passports for them. Screaming at guards to let him in the compound, Savoie was steps away from the front gate but still standing on Japanese soil when he was arrested. Savoie and his first wife, Noriko Savoie, were married for 14 years before their bitter divorce in January. The couple, both citizens of the United States and Japan, lived in Japan, but had moved to the United States before the divorce. Noriko Savoie was given custody of the children and agreed to remain in the United States. Christopher Savoie had visitation rights. During the summer, she fled with the children to Japan, according to court documents. A U.S. court then granted Christopher Savoie sole custody. Japanese law, however, recognizes Noriko Savoie as the primary custodian, regardless of the U.S. court order. The law there also follows a tradition of sole-custody divorces. When a couple splits, one parent typically makes a complete and life-long break from the children. Complicating the matter further is the fact that the couple is still considered married in Japan because they never divorced there, police said. And, Japanese authorities say, the children are Japanese and have Japanese passports.